Giant cookies are super fun, and they’re easy to make. Plus the cookie has an exciting dimension when frosted — like a cake! Frosted pumpkin cookies are a seasonal treat I’ve loved for years. This spin is perfect for the GAPS and Paleo diets, and I’m especially excited for GAPS diet folks who feel they need a special treat. GAPS treats are harder to find. 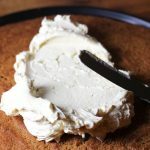 This recipe can also be made dairy-free, with an alternative to the Buttercream Frosting here. If you wish, make this cookie batter into normal size cookies; it’s wonderful no matter what. Happy fall! For birthdays, this recipe makes a fun and different birthday “cake”. For Thanksgiving, the pumpkin flavor is perfect, seasonal and festive. For Christmas or winter celebrations, this recipe can be made into traditionally sized cookies and is a great addition to any cookie plate. This recipe uses a small amount of coconut flour and then recommends sprouted nut flour, for best digestion. This guidance is especially key for those of you on the GAPS diet. It’s so easy to get by with convenience foods like almond flour and almond butter, but for healing the gut there is a much better and more effective way. Here’s how to sprout nuts! 🙂 Here’s a great dehydrator if you don’t already have one. Or this one is perfect when you are on a tight budget (it’s what we had for about 15 years). The added step is well worth it to allow our digestive mechanisms to heal! This recipe also features a bit of collagen, extra protein to balance the sweets we’re eating. Collagen (find it here) is also great for the texture of this cookie, which you’ll love — a bit cakey, just like a pumpkin cookie should be, and super moist. Preheat oven to 350 degrees Fahrenheit. Line cookie sheet or round pizza pan with parchment paper, or use a Silpat baking mat (see Recipe Notes). Combine dry ingredients in medium size bowl: sprouted nut flour, coconut flour, collagen, cinnamon, baking soda and sea salt. Stir to mix. Combine wet ingredients in medium size bowl: butter, pumpkin, honey, egg and apple cider vinegar. Whisk to combine. Add wet ingredients to dry ingredients and fold in well without over-mixing. Pour cookie batter onto prepared baking sheet. Spread evenly into 8-8.5" circle. Bake in preheated oven about 12 minutes, or until puffed in center and browned all over, without being too dark. Learn how to sprout nuts/seeds and make nut or seed flour HERE. Find grass-fed, grass-finished, pesticide-free Collagen Peptides HERE. 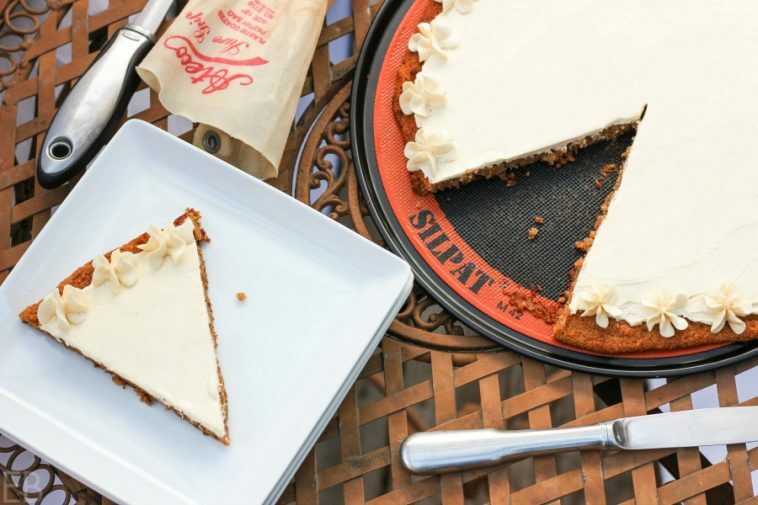 Find the Silpat baking mat HERE. Find Dairy-free Buttercream recipe HERE. Need a Fast & Easy Dessert? If you’re on the GAPS diet or the Paleo diet and perhaps not yet seasoned at making life go smoothly for yourself and your family in the kitchen, I know this recipe will help. The batter comes together quickly, and then you pour the whole thing onto a lined cookie sheet — easy. If you’re well-seasoned 😉 but still love easy recipes, this recipe will please you again and again. Enjoy!! 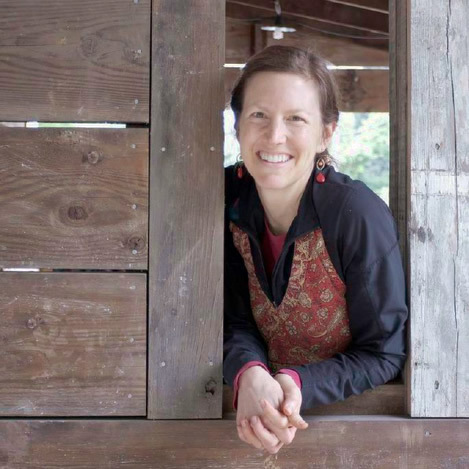 Love GAPS and Paleo baked goods that consider digestion and healing? Check out my cookbook HERE for over 125 recipes lovingly created for you. I love skillet cookies like this…so much more hands off!! And a pumpkin version, drool!! I will definitely be trying this out! 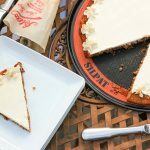 The perfect fall cookie cake! Love all of these ingredients. I need to get one of these round silpats! What a beautiful treat! And your little icing flowers are on point! But who wouldn’t want a giant cookie!? YUM! This looks great – love the ingredients! My girls will really enjoy this! 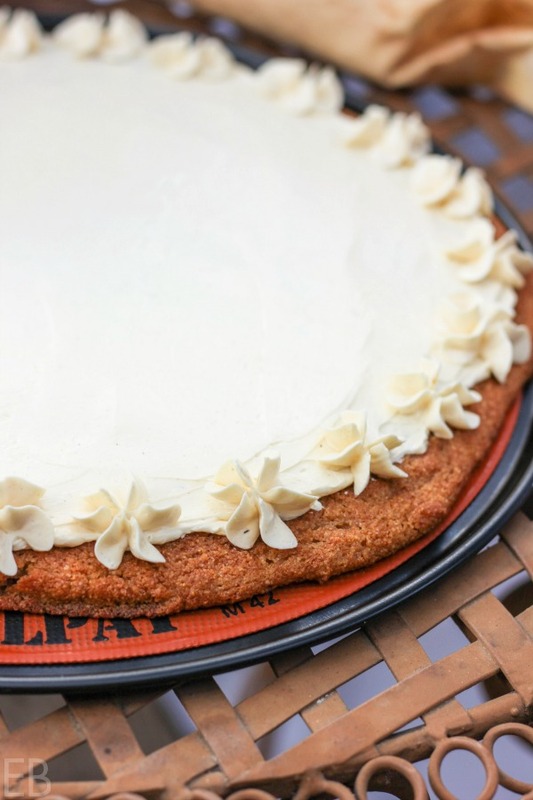 You can never go without a giant cookie, especially when it’s pumpkin flavored! I would totally prefer this over cake for my birthday. Wow ! How fun!! Love giant cookies and that buttercream frosting sounds delicious! This is so pretty! 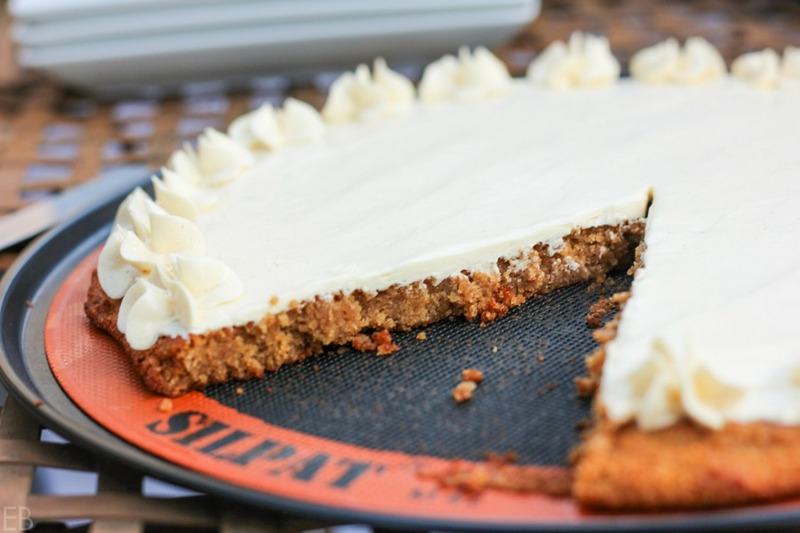 I love pumpkin desserts that look decadent but are secretly healthy. I remember passing the giant cookie place in the mall as a kid and being so enthralled with cookies THAT big! This is such a fun recipe, perfect for fall, and perfect for me! Haha, cute and thanks! I’m glad others remember the big cookie places at the mall, ha! Something about them really captures us, especially children or … grown up children. 🙂 I hope you get to make it Lindsey! What a great idea to make a pumpkin skillet cookie. I love using almond flour and think it has such nice flavor. This looks like a perfect fall treat! I love this giant cookie that’s filled with pumpkin and that icing yum! 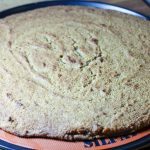 I love making giant or skillet cookies because you don’t have to bake batch after batch! 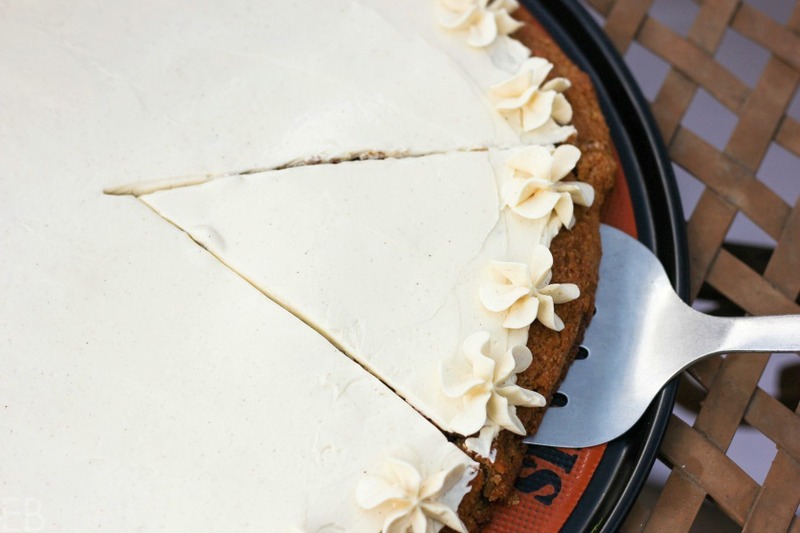 Your pumpkin version looks so good, and that buttercream frosting… well I don’t think I could be trusted with the leftovers! Hi Kristine, yes, it is! As long as the only ingredients are “pumpkin” or “winter squash”.